The smell of sweet success on the pop radio survey smells a lot like “Roses”, and that is also the name of the current single by a DJ duo who call themselves The Chainsmokers and a singer who goes by ROZES. Currently in the top ten on the building chart, a pretty big achievement in itself, the single recently surpassed the peak of the duo’s “#Selfie”, a defining novelty hit from 2014. So, if you haven’t done so already, feel free to take them off the “one-hit wonder” list, but don’t rule out a “two-hit wonder” yet. We’ll see just how high the song goes in the new year. Of course, this isn’t the first “Rose” title to go this far at the CHR/Pop format. Osmond’s remake of Bryant’s 1960 hit became her biggest solo entry on the pop survey, reaching #5. However, she did hit the top of the country survey three times in 1985 and 1986, two of those being duets. Her newest effort is due to be released on March 25. Midler’s song missed the top of the Hot 100, but it did reach the summit of the pop radio chart, making it one of five songs from a film to make it to #1 in 1980. Midler would return to the top ten in 1989 with “Wind Beneath My Wings” from the movie Beaches. Released as the third single from Open Up and Say… Ahh!, this ballad became hugely successful after the modest run of their last single, “Fallen Angel”. They last hit the pop radio list in 1993 with “Stand”. Leader Bret Michaels continues to perform solo today. After the title track from Keep The Faith barely missed the top ten in late 1992, this powerful ballad quickly found itself there and in the top five by late February. It’s also one of their longest singles to date; its radio edit runs about four minutes and 45 seconds. What a career single this was, a song that didn’t perform well overseas when it was initially released the year prior. Then, Batman Forever helped it fly to the top of the charts around the globe. The British performer’s latest album, 7, came out a few weeks ago. Though it landed a few spots away from the #1 heights of “Hey Ya!” and “The Way You Move”, the third release to be issued from Speakerboxxx/The Love Below still did some damage on several radio formats. It remains their last single to chart here as a duo. For more potted plants and the pop universe, follow the blog below and check out the “Get Social!” page to find PGTC on Twitter, Facebook and more. In addition to this month’s regular Radio Report, I’ve compiled a special top ten listing of the top seasonal songs for this year. You may have noticed a few of them ranking just below my weekly top 40 in the past couple of weeks, but there are certainly more new releases than that both on the radio and at retail right now. It’s a fun mix of original pop and soul singles, and a few remakes of the standards. Let’s just hope you aren’t sick of hearing them yet; it’s only December 1, but some radio stations have been pumping up the endless “Jingle Bells” and “O Holy Night” covers for about six weeks now. Yikes. Anyways, hope you enjoy the list, and visit the link below for our four-hour mix of merry and modern holiday cuts on Spotify. Missing any new holiday favorites? Let me know! Comment below or click the “Get Social!” tab to find PGTC on social media. The flashback “comes” and goes. Taking a large leap into the top ten this week from #18 was this second single from Love. Angel. Music. Baby., Stefani’s first solo album. First single “What You Waiting For?” spent a week at #1 on my chart, though it experienced a fast rise and fast fall at radio and retail. Teaming up with producer Dr. Dre and rapper Eve, “Rich” took in some riches and led to the album’s biggest hit, “Hollaback Girl”. It’s weird to think that Mayer never wanted this as a single, because this bluesy ballad became the most successful one from his second album, Heavier Things, cracking the Hot 100’s top 20. It remains his biggest era for me with two other top 5 hits: “Bigger Than My Body” (#1 for 6 weeks) and “Clarity” (#4). He has yet to make my chart with any of the three singles off his latest album, Paradise Valley. After hitting it big in 2000 with “Faded”, this trio took some time off before coming back as a quartet for second album Shady Satin Drug. Co-produced by Nile Rodgers, it tanked, but two of its singles reached my chart: “Cadillac Dress” and this, which peaked at #5. They’ve since split, but leader Trevor Guthrie recently appeared on a single with DJ Armin Van Buuren, “This Is What It Feels Like”. It’s the song that put producer Dr. Luke on the map and gave Clarkson one of the biggest hits of her career — at least on a national level. With a #2 peak on the Hot 100 and seven weeks at #1 on CHR radio in the spring of 2005, we were jamming out to this anthem for some time. On my top 40, “Since” fizzled out at #7 for two weeks before dropping. Even bigger hits would be down the line for her. This is probably the most obscure song in the top ten, but a lot of members on the one of the message boards I posted on rallied behind this New York singer’s debut release. Striemer, unfortunately, was another victim of Epic Records, with a single that went nowhere at radio and an album that was shelved. Now independent, “Fall” was finally released on her The Green Album in the fall of 2009. You may remember this guy from acting on The WB’s One Tree Hill or perhaps from movies like Walk The Line, but it was back in 2004 that a then 21-year-old Hilton was climbing high with his debut single. He made my chart two times after “When”; in 2005, “How Love Should Be” got as high as #12, and in 2006, a cover of John Waite‘s “Missing You” went to #25. He still records independently. With his take on a classic as originally performed by Dionne Warwick, the British soul singer gave the song some new life to a new audience. “Walk” was first featured on the performer’s greatest hits compilation, Best 1991–2004, and garnered some minor sales in several countries. It also went to Adult Contemporary radio in the U.S. to little notice. His last album thus far, Soul 2, was issued in 2011. Earth, Wind & Fire and No Doubt both took the title into the pop top 40 in the 90’s and Maroon 5 just wanted to join the party with a “Sunday” of their own. Following “She Will Be Loved”, this climbed at a moderate clip before stalling out at #3 for five straight weeks, becoming the fourth consecutive top 5 single from their Songs About Jane album. The band is still very much active today. 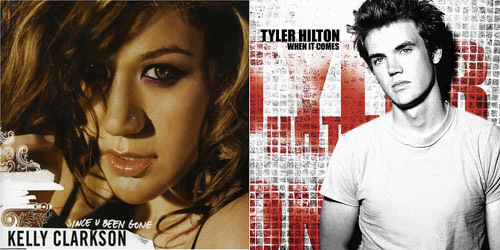 To be “Pop!ular”, I helped Hayes be popular on my top 40 chart when that first single from 2004’s The Tension And The Spark spent three non-consecutive weeks at #1. This followup release didn’t do nearly as well internationally, but after some time at #2, it would also spend a couple of frames atop of my survey in early 2005. He last charted in 2012 with another top ten hit, “Stupid Mistake”. Spending a fourth week on top was this monster smash which you couldn’t avoid on both the Alternative and CHR airwaves; not bad for a band who was ten years into their charting days at that point. “Boulevard” would prove to be the trio’s biggest hit ever, spending a total of seven weeks at #1 on my top 40. It was certified 2x Platinum and boosted sales of parent album American Idiot to the tune of 6 million copies in sales as of earlier this year. They last charted in the fall of 2012 with “Oh Love”, which just missed the top 20.